OSH brings together various healthcare and social care providers in a strategic partnership enabling pooling of resources and expertise, to deliver a unique blend of integrated healthcare and social services for seniors across different care settings. 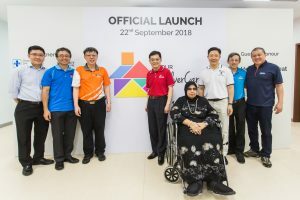 The partners of OSH are: Changi General Hospital; St. Andrew’s Senior Care (Tampines); the Eastern Community Health Centre; and the Tampines Family Medicine Clinic. The OSH also works closely with social and care groups in the wider community. the Tampines Family Medicine Clinic (TFMC). While each offers services from its domain of expertise, as OSH they collectively provide – in partnership with health and community groups – a rich, connected range of healthcare and social services focused on helping senior residents and their caregivers get timely, comprehensive, specific, and integrated care, appropriate for their circumstances. For many seniors and their caregivers, timely assessment can make a big difference, enabling care needs – sometimes subtle – to be identified early, so that the right help and support can be given. As each family’s situation is unique, the help rendered by OSH needs to be personalised combining health and social support to enable seniors and caregivers to have the confidence and be empowered to age as gracefully as possible in their homes and communities. The OSH enables a seamless treatment experience For example, all necessary information and care recommendations for intervention will be shared between respective OSH partners once consent from the senior or family has been obtained. This team-based approach will focus on the overall well-being of seniors. The siting of OSH within Our Tampines Hub, Singapore’s first-ever integrated community and lifestyle hub, allows OSH to tap on multiple other agencies and services, to offer a comprehensive range of services,. With the suite of healthcare and social services offered by Our SilverCare Hub augmenting Our Tampines Hub’s offerings, seniors benefit from convenient access to health, social and community care. For example, seniors enrolled with the SASC (Tampines) can visit the Eco-Community Garden at level 5 to grow, harvest and cook vegetables, and share it with others during lunch at the care centre. Others may like to have a game of table-tennis at the Community Auditorium at level 3. By collaborating with various partners in the community and Our Tampines Hub, health and community services can be better integrated to serve the needs of seniors with complex and/or higher care needs. For example, seniors can receive comprehensive GP services at TFMC, ancillary services for better chronic disease management at the Eastern CHC, and day care or community rehabilitation services at SASC (Tampines). Seniors can be referred to CGH should their condition become morecomplex and specialist support is required. This close working relationship between the partners enhances the management of geriatric and chronic conditions within the community. The Eastern Community Health Centre (Eastern CHC) is conveniently located at Our Tampines Hub to provide the community with easy access and affordable health services. We work with and complement medical services provided by general practitioners to ensure that residents in the community receive the medical care that they need. Services at the Eastern CHC are provided by experienced nurses and allied health professionals. 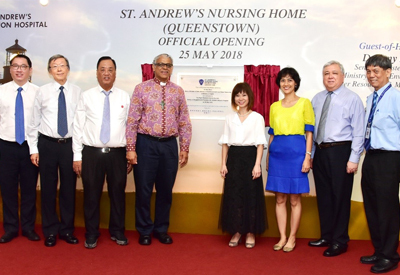 St. Andrew’s Community Hospital (SACH) provides rehabilitative, sub-acute palliative, dementia and continuing care for adult and paediatric patients after their hospitalisation for acute care at a general hospital. SACH aims to help patients recover and regain daily living functions before they are discharged back into the community. SACH has 246 beds in service. It also provides community care through its three outpatient clinics (in Simei, Elliot Road and Kampong Glam), a mobile clinic, a day rehabilitation centre at Simei, and community therapy and home healthcare services. 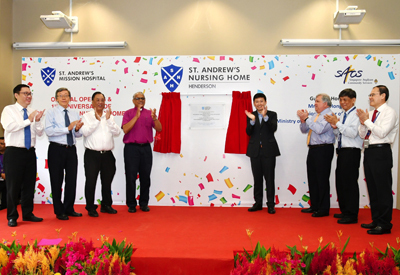 In addition, SACH operates two senior care centres: St. Andrew’s Senior Care (JOY Connect) and St. Andrew’s Senior Care (Tampines). Tampines Family Medicine Clinic (TFMC) is a multi-doctor general practice that provides a wide range of healthcare services conveniently located under one roof. Led by a team of experienced family physicians, the clinic provides doctor’s consultation for both acute conditions and chronic diseases for children, adults, and the elderly. At TFMC, patients can request for the same doctor each time they visit, thereby enhancing the personal care and attention given. Day Care: Care for seniors while caregivers are at work. Includes social-recreational activities and maintenance exercises. Dementia Day Care: Care for seniors, diagnosed with mild and/or moderate dementia. Includes a structured programme to improve seniors’ well-being and to support caregivers. Community Rehabilitation: Therapy for seniors recovering from stroke, hip fracture and other illnesses. Centre-based Nursing: Simple nursing procedures such as wound dressing, etc. Home-based Services: SASC (Tampines) taps on SACH’s Home Care Services (home medical, home nursing, home therapy or/and home personal care services). Community Case Management Services (CCMS) work with community partners, especially Community Network for Seniors (CNS) colleagues, to coordinate care for clients with complex social and medical needs. There will be more convenient access to services such as diabetic foot and eye screening for early detection of abnormality and early intervention. Individuals will be able to receive advice on management of their conditions, including lifestyle and dietary modifications. List of CHC services: Diabetic Eye Screening, Diabetic Foot Screening, Dietetics Services, Nurse Counselling Services, Physiotherapy. 3. Tampines Family Medicine Clinic (TFMC), which can be found on 3rd floor, is a one-stop medical provider for all ages – from young to old, offering a wide range of affordable primary care services, with a focus on chronic disease management. It also provides nursing, point-of-care diagnostics, and minor surgical procedures, so that patients can enjoy greater convenience, affordability and accessibility to such services. Find out more from the articles published in The Sunday Times and Lianhe Zaobao.